Psycliq is a one-man musical project by Justin Richer, working in the strange musical world of experimental electronic rock. Recently I’ve been turned on to Reddit, a kind of collaborative community news filter with a large dose of hyperspecialization sprinkled in. In any case, I stumbled across a subsection there called Game Of Bands. This section hosts a competition where musicians, vocalists, and lyricists get dropped into random teams and are given one week to create a track, from scratch. I’m especially fond of the contrast between the electric piano and bluesy, understated guitar in the jazzy verses and the pounding drums and synths in the soaring choruses. I’ve decided to dub this genre “symphonic jazzmetal”, since I don’t know what else I could call it. But whatever you want to call it, it’s now a free download as part of the ever-growing Mergers & Acquisitions free pseudo-album. Enjoy! One of the best things about a home studio is that once you’ve got it set up, you can just start using it. You don’t need to book time, you don’t need to schedule things ahead of time, you don’t need to hire somebody else’s engineer. Just pick up your instruments, fire up your control board, and go. Every note of Psycliq’s musical catalogue has been recorded in my home studio, with the execption of those couple of tracks I composed and recorded while on an airplane that one time. In other words, the studio part is pretty great. But one of the worst things about a home studio is that your recording space needs to be shared with the rest of your life. Even if you’re lucky enough to set a room aside, the rest of the house is still likely to be buzzing with all kinds of noise from kids, spouses, TV’s, radios, pets, and all kinds of other things. In other words, the home part of “home studio” isn’t all it’s cracked up to be. For one, the setup definitely makes recording things like vocals or acoustic instruments very, very tricky. But the other issue is one of distractions, especially if you’ve got kids and they want to play the instruments and push the buttons and turn the knobs just like Daddy does. One moment you’re all set to sit down and record a new idea, and the next moment you’re desperately trying to figure out why every input to your box has been padded by -15db while trying to figure out exactly where your headphones are now. You may have guessed that I speak from experience. For these, and many other real-life reasons, I’m going to be relocating my home studio to a different part of the house. One a bit more removed from the rush of toddlers. One a little more isolated from the noises of every day life. And most importantly, one with a door on it. Pro tip: doors are good. But even with a planned studio shuffle and all kinds of life in the way, we’ve got some goals here at Psycliq Musical Productions for 2012. As we move into the year, I’m going to be diving back into recording and making a new full-length record. The lucky folks who subscribe to the Newsletter already know the title and more information about it, and they’ll keep getting some exclusive updates, too. But suffice it to say that I’m very excited about the prospects. I’ve set a goal of getting it released by the end of this calendar year. At the moment, I’ve got 20 tracks demo’d out that might make it, but who’s to say what the cutting room floor will really see. We might even put up a preorder bonus thing that gives you access to all of the demo tracks, whether they make it in or not. But whatever comes, I’m going to try my darndest to get this thing rolling. Here goes nothing. After months of work in my off hours and spare time, and learning a pile of new skills I never had before, I am very happy to say that the MicroMoorg project is finally done! The results are right here, and I’m very happy with how it came out. Check it out! 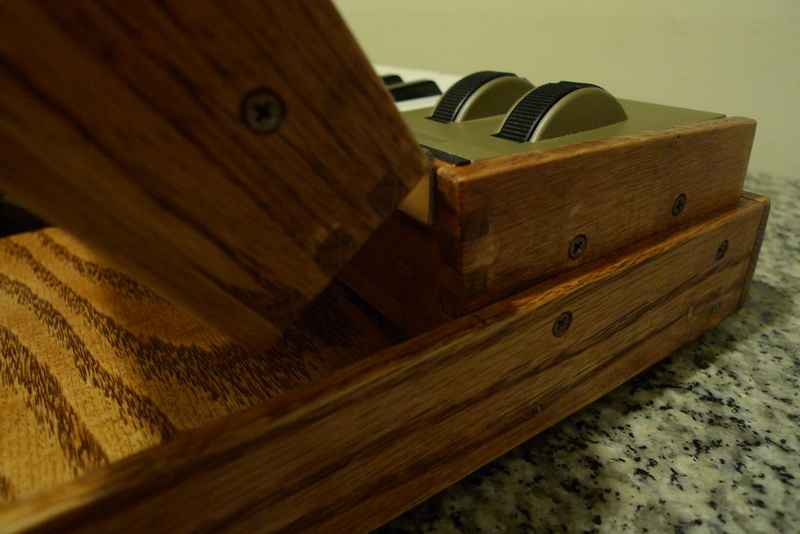 The new casing is made completely of red oak, a nice dense hardwood, with a thin but sturdy piano hinge to hold the pieces together. 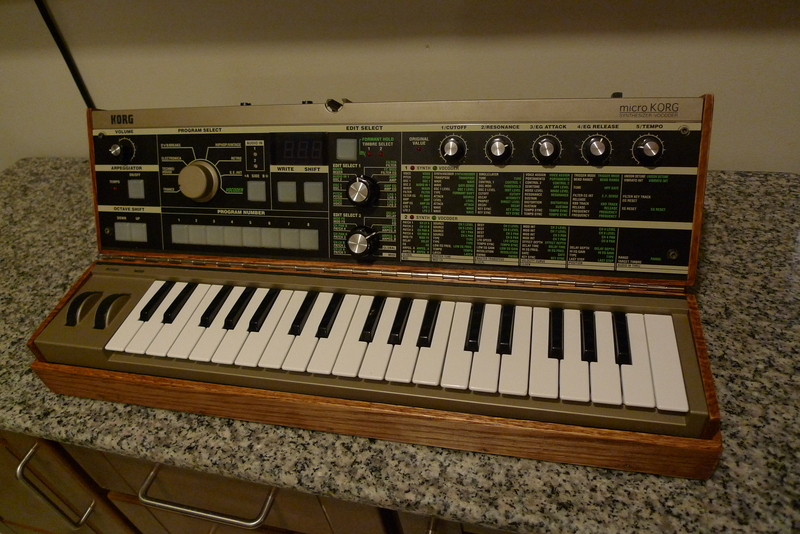 It folds through three positions from a very MS20ish almost-straight up and down, a more Moogy reclined angle, and all the way back to the original flat MicroKorg shape. This last bit was very important to me since I wanted to make sure I could still carry it around in the same gig bag that I had for years. Thanks to this project, I know more about woodworking an soldering than I ever have before. Take if you will all that wood along the outside edges of the top and bottom pieces– it isn’t just decoration, it’s structural. Once you cut the little Korg in half, you end up without much in the middle that you can attach something like a hinge to. I had the epiphany one day of building these rectangular U-shaped pieces and attaching them to the sides of the old plastic housing. This would give me a nice solid structure that I could run a full-size piano hinge along, but it came with its own complications. For instance, how are you supposed to even build something like that? 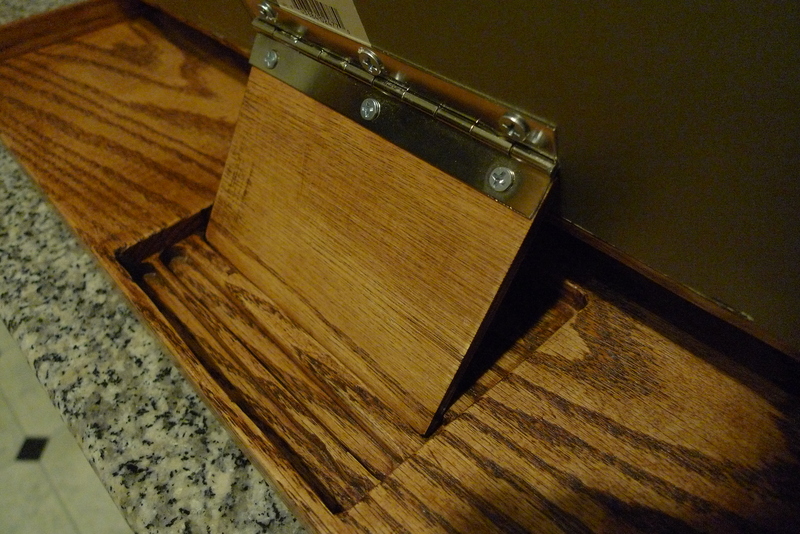 According to the Internet, real woodworking types use finger joints to make corners for thin pieces of wood like this. Having absolutely no idea how to do this, I watched a few videos on YouTube and went on my way. After a couple false starts, I eventually picked up the right set of woodworking tools (some new bits for the router and some bigger clamps, for instance) and finally made it work right. Once I had these pieces finished up, I was a lot more confident that I might be able to pull off the rest of the project after all. 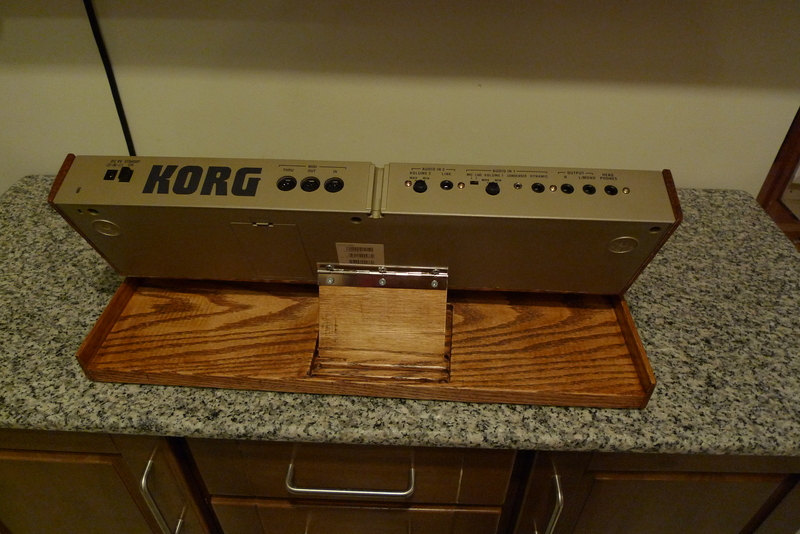 You’ll note that the side pieces are cut at a gently sloping angle, to match the MicroKorg’s original shape when flat. While this did make things a bit trickier to measure, cut, and fit, the aesthetic results were well worth it. But another issue with the new design was the wiring. Back when I’d first decided to take this project on, I was planning to simply have an open space between the two halves for the wires to go through. 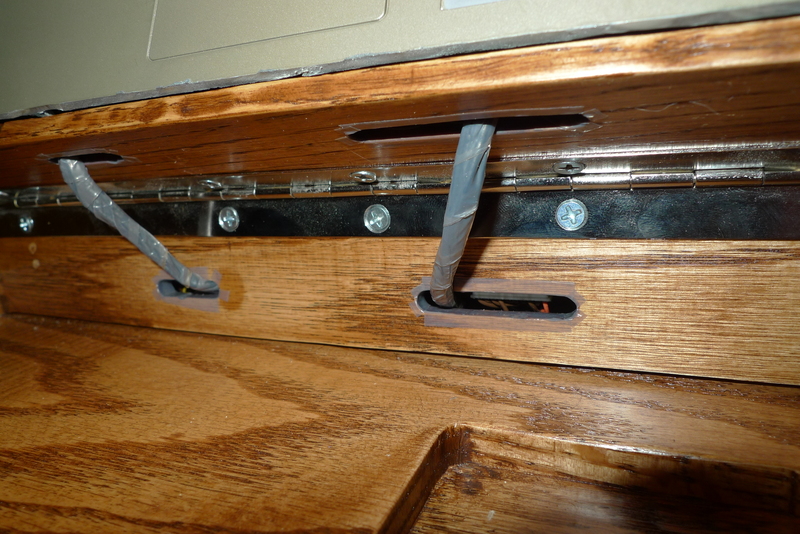 With a big hunk of wood in the way on each side, this was obviously not going to work anymore. 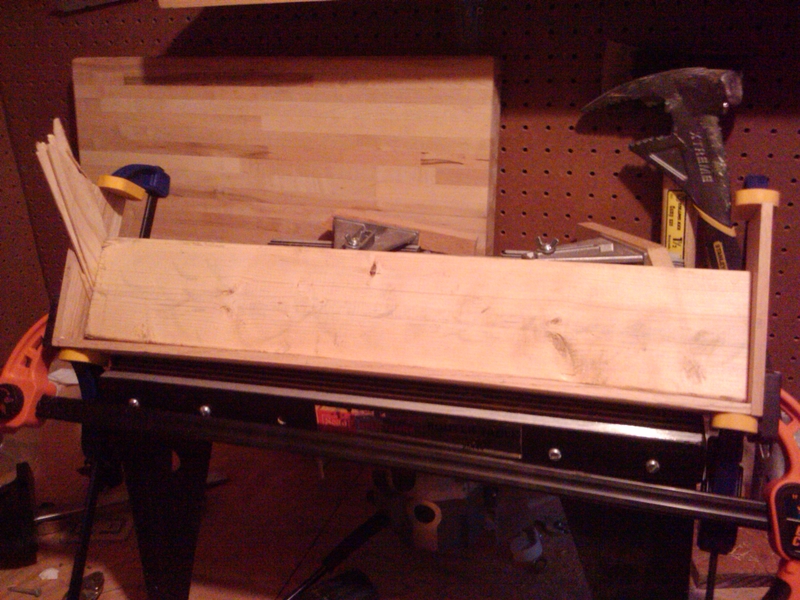 But since I was working in hardwood, I was able to drill some slots in each side without compromising the structure. But then with all this extra wood in the way and the wires now having to snake around a bit, I would need to extend all of the signal and ground wires. I toyed with the idea of trying to find new, matching wires, or putting longer wires into the existing headers, but eventually settled on cutting each of the signal wires in half and soldering in about five extra inches of 26 guage wire on each one. This would give me more than enough space to make it through the full rotation. In fact, I measured the extensions such that the soldered joints would always remain safely inside of the housing on either side, no matter what position it’s in. Finally, I wrapped each piece and all of the openings in a thin coating of teflon to make sure everything would slide along nicely without wearing through the wires or getting anything bunched up. Finally, I had to figure out the base and kickstand. The base is a solid hunk of red oak, and it accounts for a large portion of the weight. 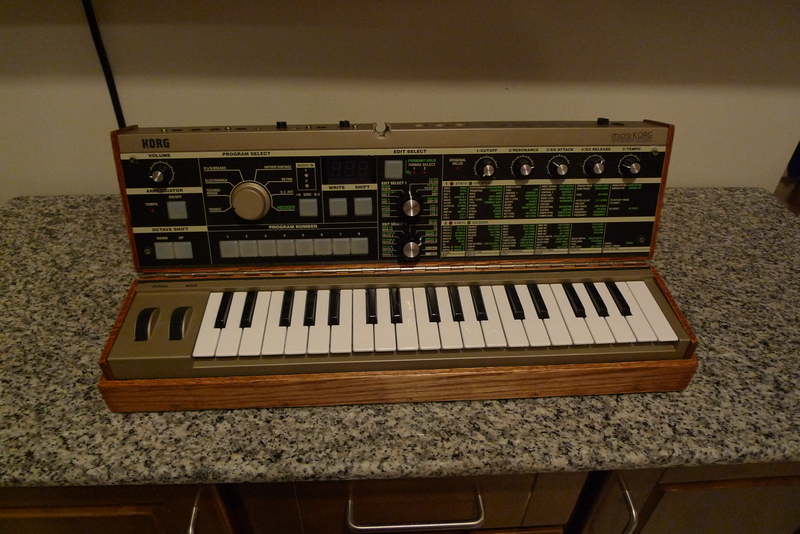 As a matter of fact, the whole thing weighs 9.9 pounds now, roughly twice what the starting weight of the MicroKorg alone was. I did build the whole thing in such a way that I can completely detach and replace the base at a future date, should I be feeling frisky enough to make a new, lighter, better one. The side rails on the base are simply nailed on in place, too. I could’ve done the same finger joints that I’d used to make the upper hinged casings, but those are hard to do, and I didn’t have to here. The kickstand was tricky. I wanted something that would let me pick from a couple discrete positions, but it still needed to fold completely flat. First I tried to find pictures of how Moog does it, but nobody wants to take a picture of their MiniMoog from the back while it’s open. I drafted out a couple ideas, but in the end went with a very simple single-hinged kickstand with a grooved slot in the bottom. The top bit of the hinge is reinforced by an unseen piece of oak on the other side of the plastic, which also helps stiffen the back panel a bit, since it’s only screwed in on one side now. I will eventually put in a bit more reinforcement to this piece, but for now this works, and works quite well. You may notice a bit of extra space in the back of the well that holds the kickstand when the whole thing is closed up. This little extra gap is very important, as physics cruelly dictates that a rectangle’s diagonal is longer than its sides. So, when it’s opening up, that space gives the little foot someplace to go before it comes back to normal. A hand-rubbed finish went on all of it, with some cursing at the dusty surfaces in my shed. I added a bit of trim to set off the rough edges of cut plastic, some simple rubber feet for tabletop use, and there you have it: The MicroMoorg. 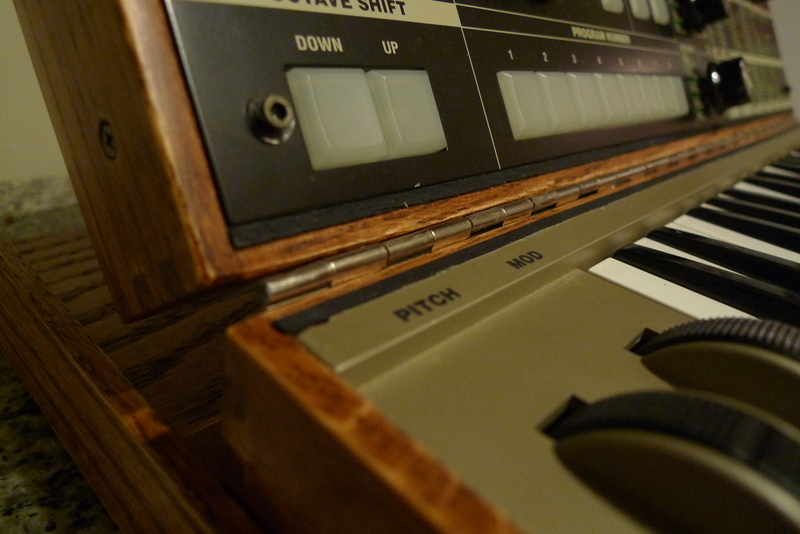 Apart from one of the arpeggiator buttons being a touch wonky (but still functional), everything works great. All the controls, all the keys, the wheels and knobs, everything. I even managed to get all of the screws back in without any leftovers! 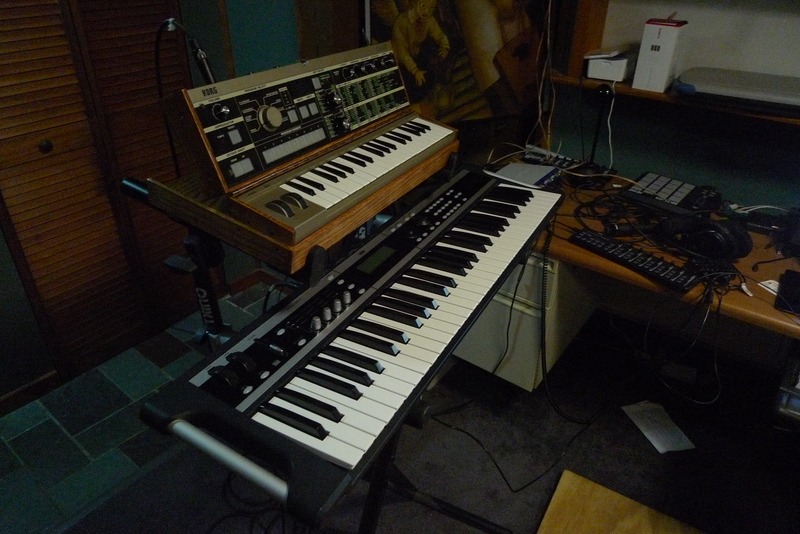 I just set it up into its old home above my Korg x50 (I really am a Korg fanboy, that’s a nanoKontrol2 in the background and I have an old X3 out of the shot here), and this two tiered setup is fantastic to play. I set out on this whole project figuring I’d like it, but I am in love. Having the edit matrix and the real-time knobs right in front of you is wonderful. And, if you ask me, it just looks amazing up there! Now that I have this project finally wrapped up, I should probably get back to making music, shouldn’t I? As happy as I am with how this project came out, I’m not sure you could pay me to do it again. Well, maybe if you payed me a lot. And you were really nice about asking. But really, back to new music: If you sign up for the newsletter, I’ve got some interesting things to tell you on that front in the near future, too. 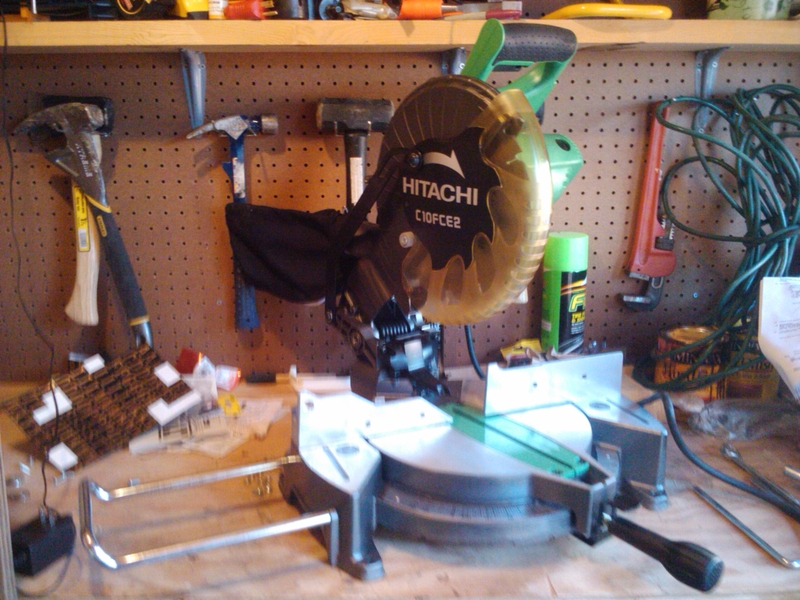 I got a new saw for Christmas, and I don’t mean the waveform. 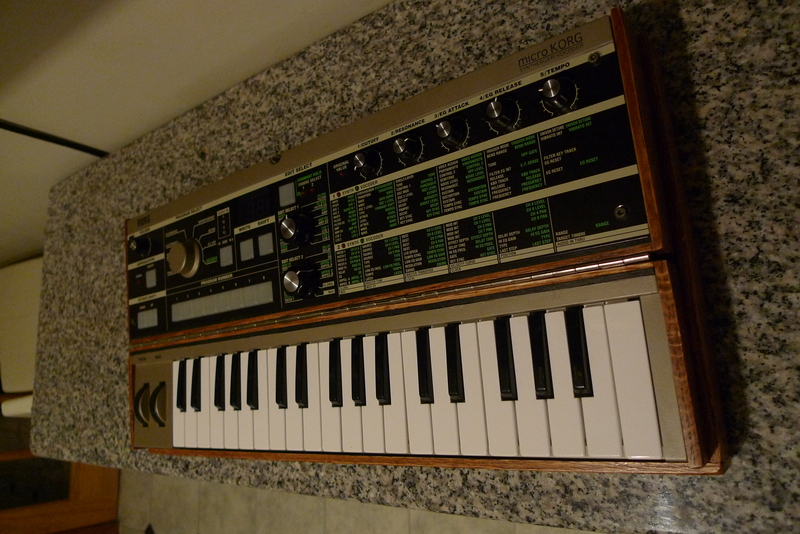 After a break of a few months as I figured out what I was going to do, I have been able to add another chapter to the story of my continuing efforts to mod my microKORG to look more like a MiniMoog, imparting an already awesome little synth with even more awesomeness. As I said in the last update, I had decided on a design I was fairly sure would work as long as I could pull it off right. With measurements and plans in mind, I hit up the local hardware store and picked up some red oak stock to work with. I knew the basic design that I wanted, but I wasn’t sure how to make a strong joint between the boards. I’m a computer programmer, not a carpenter, after all. But the internet wasn’t about to let me down, and through many webpages and a handful of YouTube videos I was able to teach myself how to make something called “finger joints” which are all the rage in fancypants cabinetry. My first attempts were fairly pathetic, but after finally getting the correct router bit and clamps that were actually the right size, I started to see something with promise. Quite a few hours of work and several tries later, I had a version of the joints I thought had some promise. I clamped it up, let it dry for a couple hours, and hoped for the best. When I came back, much to my delight, things had stuck. 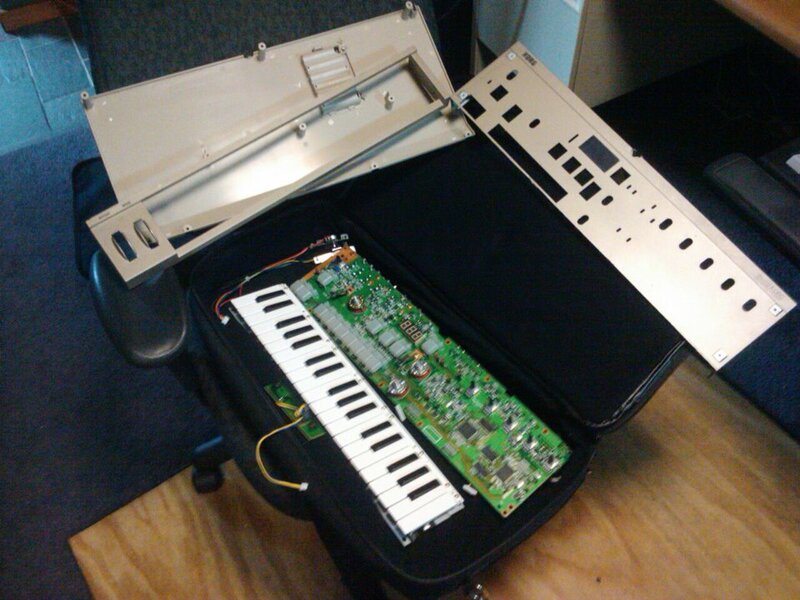 Not only that, but the pieces of the microKORG’s shell actually fit into it perfectly! The next day, I measured and repeated the process for the shell for the bottom section. When I finally got them all together, I was a bit shocked with how well it worked. 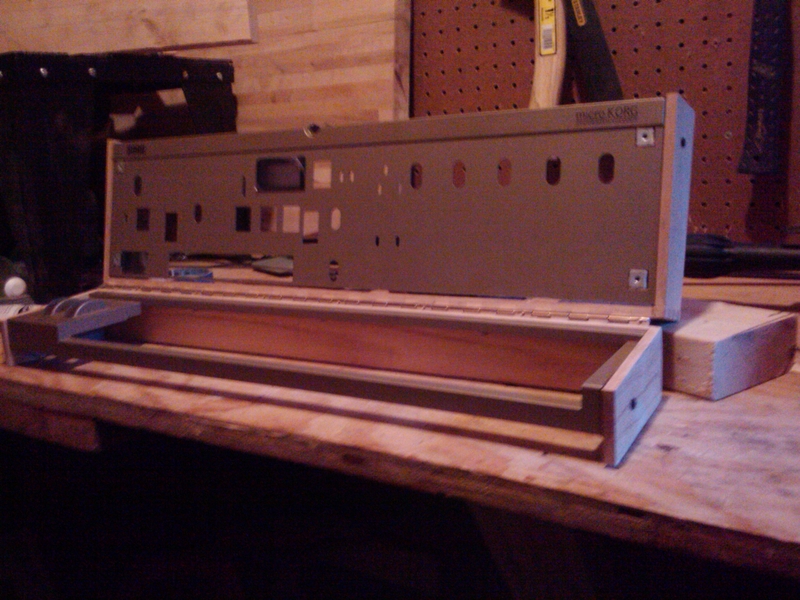 You can see here the two main case pieces in what will be the laid-flat position, for storage and travel. Unlike other MicroMoorg mods that I’ve seen on the web, I wanted mine to be able to transform between an open playable position and a closed storage position without sacrificing usefulness or stability in either. With the two pieces in hand, I very carefully measured and cut the piano hinge I’d bought for the project and mounted the two together. As you can see from the picture here, it actually works! You can lay it down completely flat or bring it up all the way past vertical. It feels quite solid and I think it will do very well when the whole thing’s put together. I still have quite a long way to go on this project. Tomorrow, I’m going to be measuring and cutting the holes for the cables to pass through between the two halves. I’ve already picked up the wire to extend all of the cables, but that’s going to be a whole weekend project unto itself, at least, as I’m not really all that good at soldering. Then of course I need to build the base and finish all of the wood pieces. I’ll be sure to keep posting progress as it’s made. Really, I can’t wait to have it put together so that I can play it again. I love this little keyboard, and I miss having it in my arsenal. It turns out that you can in fact use it without the case or keys attached, but it’s somehow not quite the same. Update: And once again, it’s gone into the vault. Listen again next Christmas! It’s the holiday season, and that means that once again we’re releasing a free Christmas album, Light The Tree For Some Holiday Cheer. You can download it right now, totally for free, from our music website! You can also listen to the whole thing on line, also completely for free. As we’ve done for the past few years, there’s a brand new track this year that’s been added to the album. This time around, it’s a very unique take on the classic “Winter Wonderland”, with a bit of an apocalyptic twist to it. I don’t want to spoil it for those who haven’t heard it yet, but I will say that it’s been getting good reviews from fans so far. I even put together a YouTube video for the track to make it even easier to listen to! So check it out, download the track for free, then click that share button and tell all your friends! Originally, I was going to keep House of the Rising Sun a digital–only product, since I’m continuously told that that’s the future. We’ve sold a few copies that way, sure, but something was just nagging me about it. I finally just admitted that I’m a bit of a curmudgeon and went ahead and put together a physical CD package. Here you go. Honestly, the print quality isn’t as nice or consistent as a pressed CD, but it is darned close, and there’s no minimum order. In fact, there’s no warehouse of these anywhere! CreateSpace just cranks them out as people place their orders. So what are you waiting for? Go put them to work! You can even get it in time for Christmas if you order soon. Speaking of Christmas, work still continues on this year’s free Christmas track, and I’m hoping that it’ll be all put together by the end of the week. It’s turning out to be quite interesting so far. 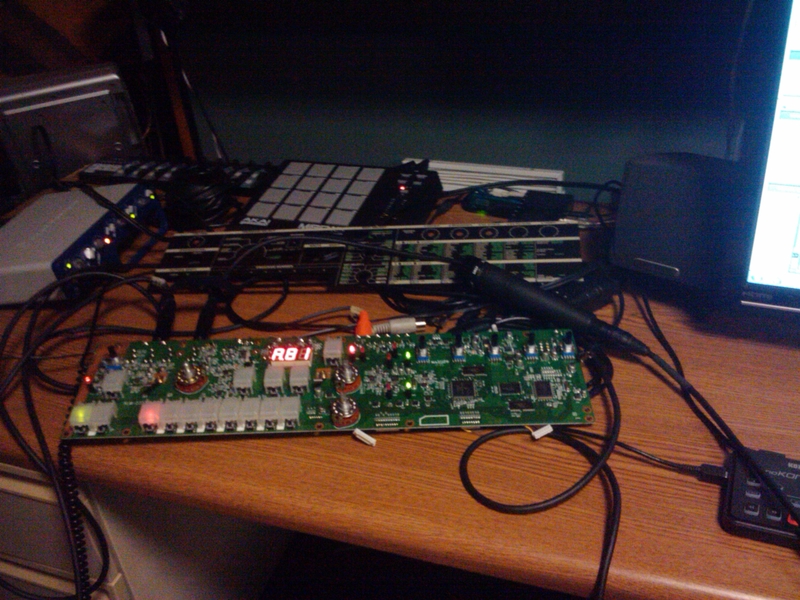 I may have spilled some dubstep on it, too. Every year for the past while, Penny Arcade has hosted a charity event called Child’s Play that gives presents to sick kids in hospitals all over the world. Being a big gamer myself, I’ve been a big supporter of this every year, trying to donate at least a couple games to the cause. Some people do a bit more than donate a couple games though. For the past couple years, the crew of Loading Ready Run have done a marathon playing of the world’s worst video game, Desert Bus. The more people donate, the longer they have to play this horrible game. They televise it live on the web (webivise it?) so that you can partake in their torture. I have decided that from now until the end of Desert Bus, all profits from sales at our Bandcamp music site will go straight to Desert Bus and Child’s Play. I’ve set it up so that you can donate more than the minimum price of each album, too, if you’d like. In addition, the top donor will get a copy of the ultra-rare, no-longer-available Telegraph EP. That is one sweet pig. 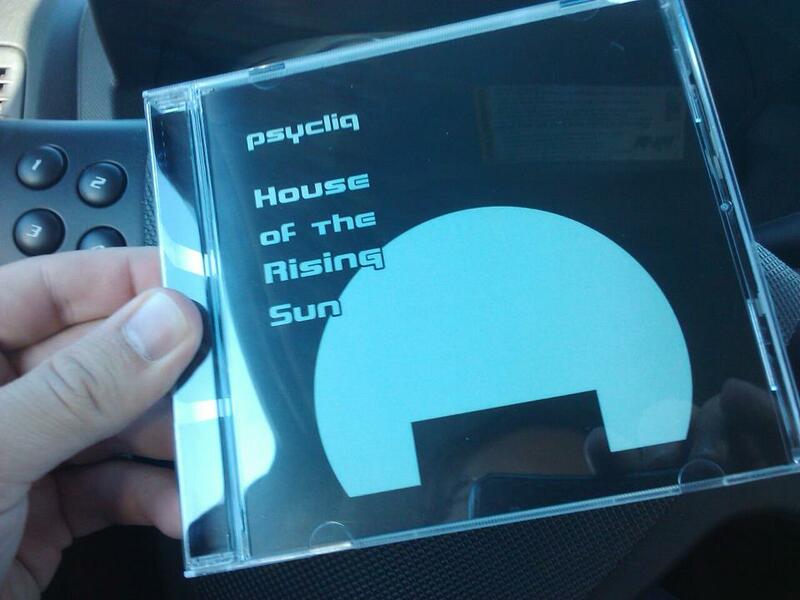 Go out to music.psycliq.com, get some music, and help out sick children today. 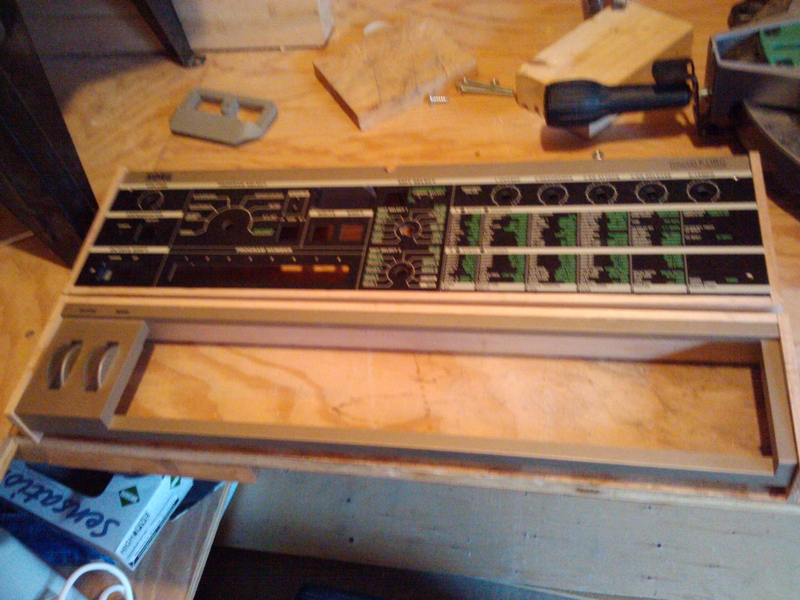 You may recall that a little while ago, I cut my venerable microKORG synthesizer in half in an attempt to build my own MicroMoorg style synth. As soon as we had it sliced apart, it became clear that putting it back together the way I wanted it was going to be a bit trickier than originally anticipated. So I just popped the guts back into the shell and kept it safe in its bag for a while longer to think about it. Then, the other night, I had a revelation as to its construction. Initially, I’d been thinking about how to attach some plates to the open space between the two halves of the shell to hold the hinge, and then just tossing some pieces on the side for decoration. That’s when it occurred to me: by making the side pieces actually part of the structural integrity of the project, I could give the important pieces a lot more to hold on to. This seemed like it was going to be outside of my woodworking skills, so I sought professional help. With a basic plan in mind and parts of the plastic shell in hand, I headed out to a local unfinished furniture store last night for some advice. I was hoping that they’d say something like “Oh yeah, we can just toss that right together for you!” Unfortunately for me, my little out-of-left-field project didn’t quite fit with their more pedestrian furniture building. Different lumber sizes, doesn’t quite fit into their existing jigs and frames, etc. However, I did get some good advice for how I could put the thing together myself, so I’ve got something to go on. Looks like a new miter saw and some hardwood lumber stock are in my future. Not generally two things that you associate with synthesizers, but hey, we’ll see what comes out. 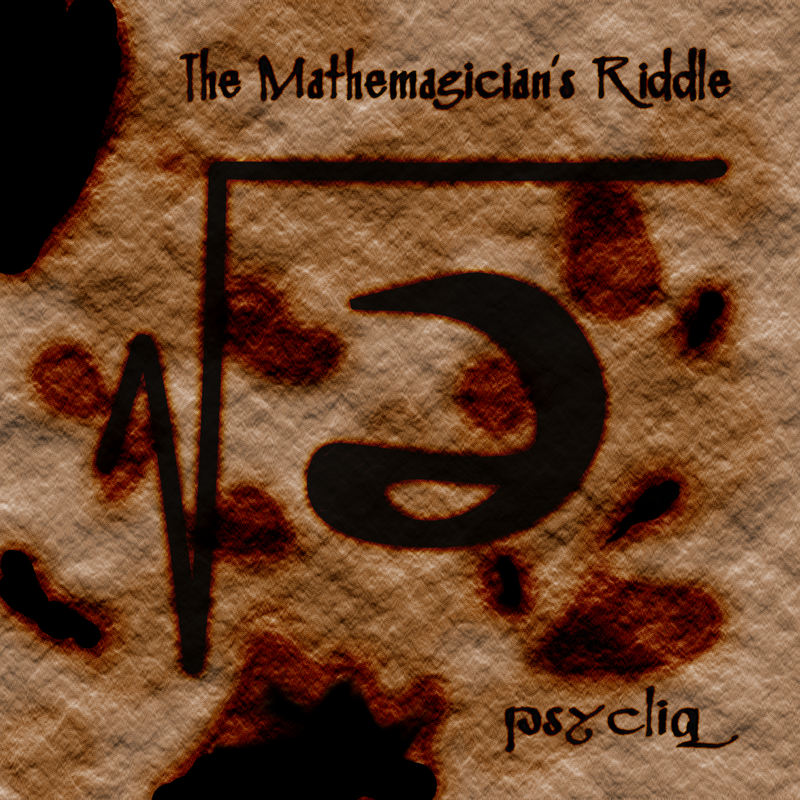 Way back in what feels like ancient history (but is actually just 2007), I released the first Psycliq album, an EP entitled The Mathemagician’s Riddle. Those handy with the Google can likely discern that the title itself comes from a fantastic web-based puzzle game I played some years prior called Planetarium. Specifically, one of the first puzzles in this charming game really struck my imagination well. But what most people don’t know is that the album originally didn’t have a pronounceable or easily transcribable title at all. Instead, the odd symbol on the front of the album artwork, the schwa symbol (the upside down e) in the middle of the square-root sign, was going to be the title. The intent here was for it to be a mathematical computation on a nonmathematical symbol, sure to confuse mathematicians and linguists alike. And that was exactly the point – it was a riddle, see? I was apparently feeling rather avante-garde, or something like that. Ultimately, like many of my ideas, this was far too clever for its own good and somehow I had the good sense to have a real title for the album. But, as you can see, I did keep the original artwork with its odd symbol, all the while thinking that my cleverness was fully intact. I laughed at my little inside joke, but that was until the other day at work when a colleague of mine, a mathematician himself, commented on the cover art, stating that it actually did have a value of about 17.52. Here’s how that works. The schwa sign, it turns out, is based on the old Hebrew vowel symbol shva. This in turn can be spelled with the three Hebrew letters shin vav aleph. Hebrew letters apparently all have numerical values, a fact that I had learned from the movie Pi but forgot, which means that the schwa sign can be assigned a numeric value of 300 + 6 + 1, or 307. 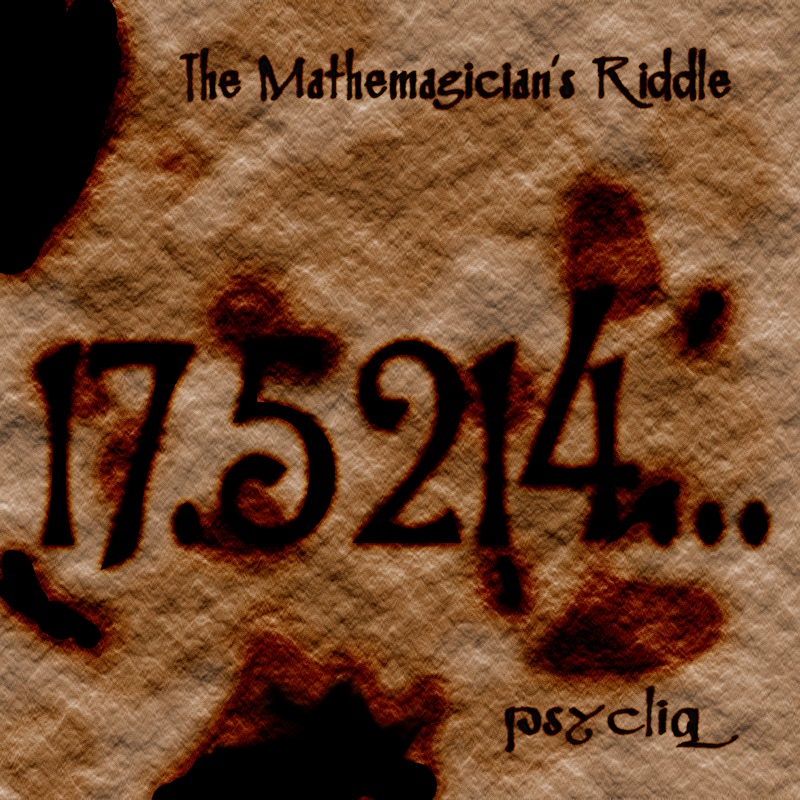 Take the square root of 307, and you get about 17.52, thus a perfectly reasonable answer to The Mathemagician’s Riddle. Next, I’m sure someone’s going to try and execute the state machine on halt or fit a function to the graph on Results Not Typical. Nerds, stealing all my fun!